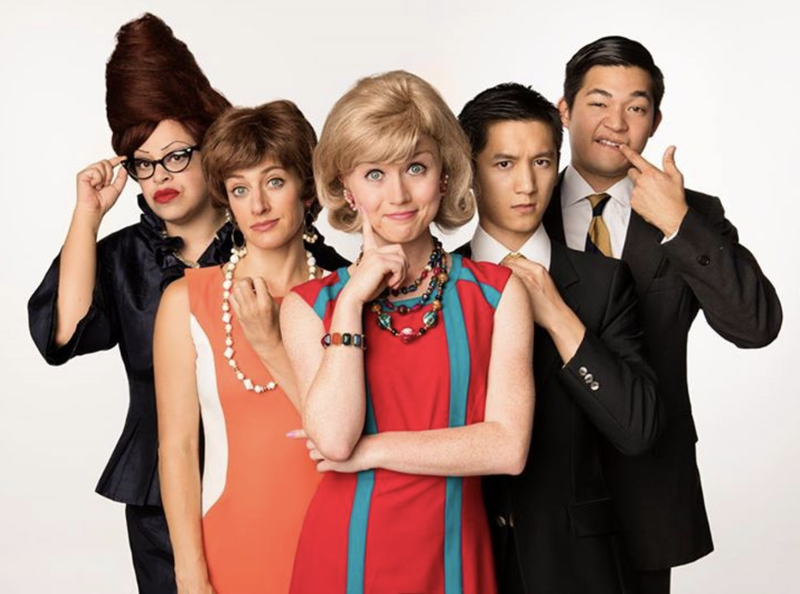 A photo of me (center) in Bay Area Musical’s “How to Succeed in Business Without Really Trying” 🎭🎶Photo by Ben Krantz. In July of 2017, I wrote a post on Medium titled What It’s Like to Be a Woman at a Tech Conference. The article has since been viewed ~64k times, and has become the piece of writing I am most recognized for. 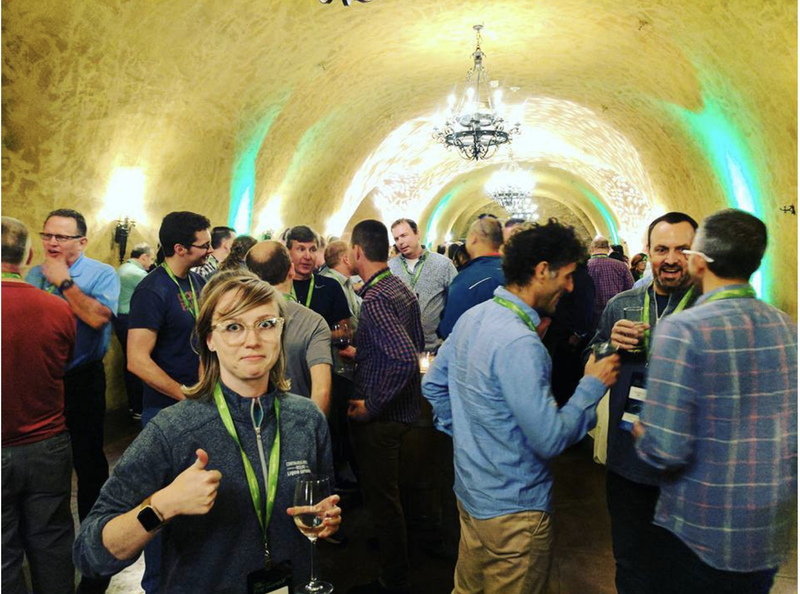 Usually if someone says “hey you look familiar” at a conference, I do the pose (😐👍pictured below) mimicking me in a wine cave full of dudes, and they figure it out. Then, in late July, a woman named Alexandra Levin Kramer reached out to me asking if I’d be interested in speaking at one of her meetups/breakfasts in New York that centered around having women in tech speak and share expertise about their tech careers. The group happened to be focused around women in blockchain and crypto, but my talk would be about my diverse background and unique path into the industry. I didn’t end up speaking at the event (it was late September, and in the middle of the Jewish high holidays… and it was NY ✡️), so it never ended up happening. I ended up joining the group on LinkedIn (just in case I was ever back in the area and we wanted to try again), Alexandra and I kept connected through LinkedIn, and I didn’t think much of it. Me checking my LinkedIn inbox. Did you know that LinkedIn has groups? Yeah, me neither. I think I had joined a couple here and there over the course of the last 10 years, but it’s not like I’m constantly browsing my LinkedIn groups... or have ever taken the time to look at them. In fact, take a second, open LinkedIn, and try to find the “Groups” area. I’ll wait…. Took you awhile, right? It’s not a frequently used feature. In my experience, LinkedIn is really a tool mostly used by recruiters, engineers/hiring managers when they are looking up a candidate before a phone-screen, and older white business men to add me for no apparent reason. My dad keeps asking me why he keeps “getting emails from LinkyDin?”, which I’m sure is due to LinkedIn’s frustrating “WANT US TO SEND A REQUEST TO EVERYONE IN YOUR INBOX? EVEN YOUR EX? EVEN A WOMAN YOU ONCE BABYSAT THE CHILDREN OF IN COLLEGE? AND THAT ONE GUY YOU BOUGHT A COUCH FROM ON CRAIGSLIST IN COLLEGE? OH NO YOU DIDN’T? LOL SORRY TOO LATE” feature that people usually click on accident. 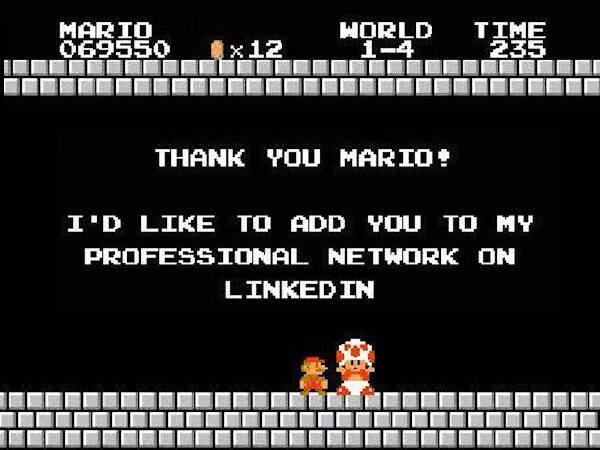 It’s a terrible way to trick users into blasting out LinkedIn to their contacts, and preys on an older demographic that is likely to click the nice blue shiny button. From a design ethics standpoint I find it disgusting... but I digress. I understand how Harry must have felt. And why did this happen? Well, I got added to an article titled “200+ Thought Leaders in Crypto and Blockchain — The Ultimate Crypto List for Event Planners, Influencers and the Like” by Michelle Tsng. An article which I lovingly call “200+ Women Copy and Pasted from a LinkedIn Group I Forgot Existed”. Then, I was subsequently added to this Everipedia article. Thus beginning the lovely game of telephone which has become my “Crypto career”. 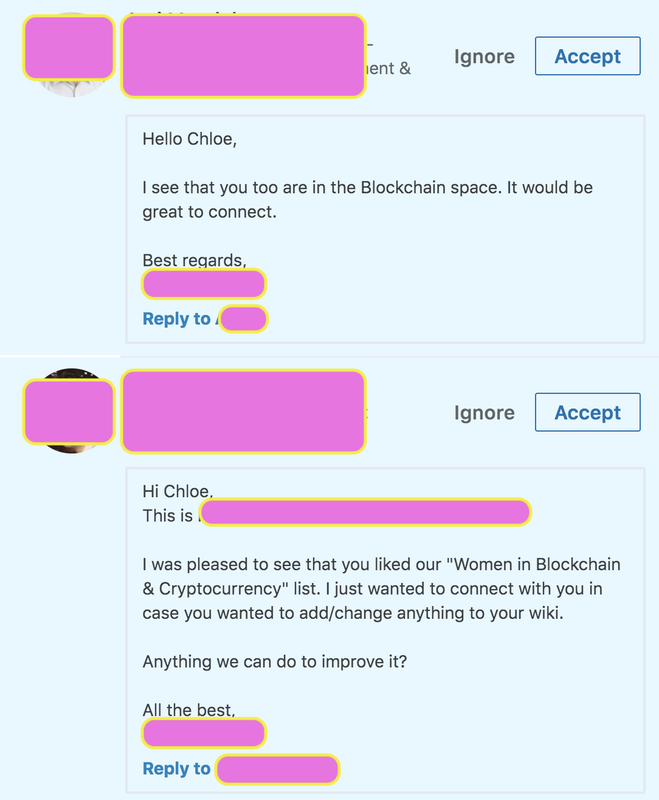 Join a LinkedIn group, forget about it for about 6+ months, don’t learn anything about crypto. Get copied and pasted into several articles, and continue to learn nothing about blockchain. Insist that you know nothing about it. Tweet about how ridiculous how little you know about it. Put a line in your LinkedIn about how you literally know nothing about it. The opportunities will roll in by the hundreds! I know so many women who are actually influencers in the space who are not on this list (for example, my girl Ali over at Stellar). Reach out to her. Not me. I am not the droid you are looking for. While it’s been fun to tweet and share stories about all the ridiculous things that have occurred because of this mix-up, it really has gotten out of hand. What started as jokes on Twitter about me actually being Satoshi Nakamoto, have now turned into hundreds of messages a week from earnest people looking for advice about crypto. It’s getting old real fast, y’all. Well, thank you kind sir or ma'am on the Internet for your advice! 🙄 Let me break it down for you: I’m an actress turned developer evangelist. In the last 2 years I’ve completely transformed my life, changed careers, and made an extreme lifestyle change. I’m still learning how to be an engineer. It’s my decision to choose what I want an expertise in, and it’s not crypto and blockchain. Right now, I’m focusing on my job at Sentry and also starting to build some fun mobile side projects. I juggle a full-time job, press interviews, a meet-up I organize, a social life, a relationship, and try to fit some time for my personal to-dos and downtime somewhere in there… I don’t have the passion or room to add this expertise in my life. What Does This Say About the Industry? Well, you know me. I’m all about getting more women in tech. Especially more women in front of audiences in tech. The more exposure and public figures that help show the world “hey- an engineer can look like this”, the better. But here’s what not to do: Don’t force women to be a show-pony for your technology/company/cause. Yes, encourage women to speak if they desire to. Yes, coach the female developer on your team to give a successful talk at your user conference because you offered your help and she enthusiastically said yes. Yes, coach and mentor women on your team to write and create content for your company because they want to and she is qualified. But here’s a secret: not all women enjoy public speaking and being in the spotlight. 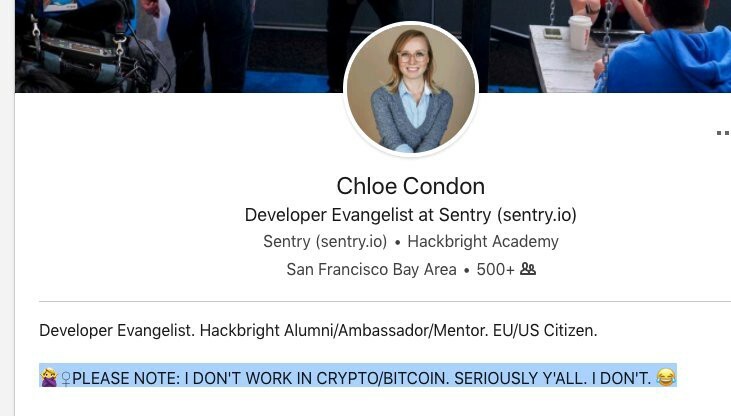 Also, not all women enjoy crypto and blockchain… (ahem). Yes, the industry lacks diversity, but it’s not your job to fix it all by yourself. You can make small efforts and changes in your day-to-day (speak up if a woman in being talked over in a meeting, make sure the woman in the meeting isn’t taking notes, make efforts to build an empathetic and inclusive team, etc. ), but to really change this industry, it’s going to take time, effort, and an investment in making computer science engaging and exciting to young women 👧🏼. Don’t just add them to a list and expect things to change overnight. Also, make sure that list has been… well… um… vetted? Additionally, we also need to make the industry more inclusive to candidates with diverse backgrounds. But that’s a whole other blog. Anyway, I hope you’ve enjoyed learning about my #journey into crypto, and I hope that my tips and tricks help you succeed in this very new and exciting field. Musical theatre actress turned developer evangelist.